Combined oil production (crude oil and lease condensate) from the top five U.S. oil-producing states increased during 2011 (see chart above). The biggest gains were in North Dakota and Texas, due in large part to increased horizontal drilling and hydraulic fracturing activity. Texas, Alaska, California, North Dakota, and Oklahoma accounted for about 56% of U.S. oil production last year, according to EIA's February Petroleum Supply Monthly report. Texas. The Eagle Ford shale formation in south Texas contributed to gains in the state's oil production, which averaged 1,425 thousand barrels per day (bbl/d), the highest level since 1997. Alaska. Oil production fell for the ninth year in row, averaging 563 thousand bbl/d. California. Oil production averaged 535 thousand bbl/d, the lowest level in at least three decades. North Dakota. Preliminary data indicate increasing oil production from the Bakken formation pushed North Dakota ahead of California in December as the third biggest oil-producing state. 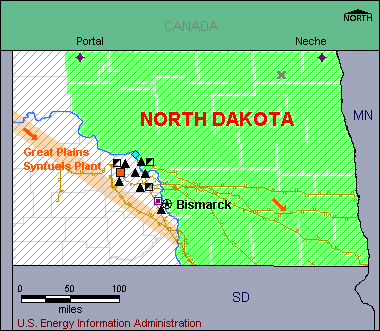 North Dakota's oil production averaged 535 thousand bbl/d in December 2011 and 419 thousand bbl/d for the year. Oklahoma. Oil production averaged 204 thousand bbl/d during 2011, topping 200 thousand bbl/d for the first time since 1998. The State’s signature type of crude oil, known as West Texas Intermediate (WTI), remains the major benchmark of crude oil in the Americas. Texas’s 27 petroleum refineries can process more than 4.7 million barrels of crude oil per day, and they account for more than one-fourth of total U.S. refining capacity. Approximately three-tenths of total U.S. natural gas production occurs in Texas, making it the Nation’s leading natural gas producer. 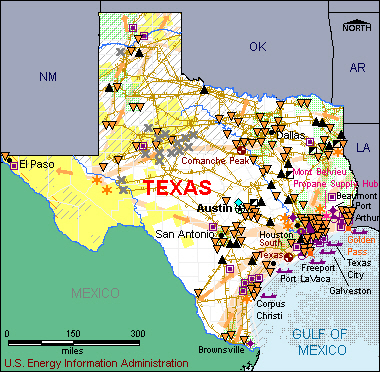 Texas also leads the Nation in wind-powered generation capacity; there are over 2,000 wind turbines in West Texas alone. Texas produces and consumes more electricity than any other State, and per capita residential use is significantly higher than the national average. Excluding Federal offshore production, Alaska ranks second in the Nation in crude oil production. The Trans-Alaska Pipeline transports crude oil from the frozen North Slope to the warm-water Port of Valdez, on Alaska’s southern coast. 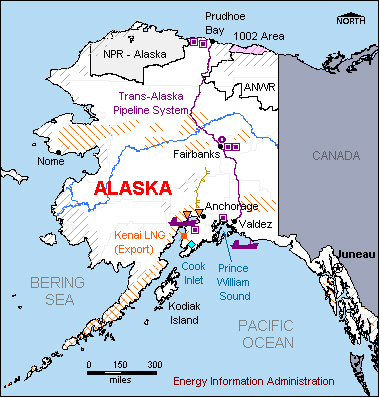 Alaska has six oil refineries, most of which are “topping” plants. Alaska’s electricity infrastructure differs from the lower 48 States in that most consumers are not linked to large interconnected grids through transmission and distribution lines. Rural communities rely primarily on diesel electric generators for power. Plans are being discussed to develop two small nuclear facilities to help meet electricity demand in Alaska. California ranks third in the Nation in refining capacity and its refineries are among the most sophisticated in the world. California’s per capita energy consumption is low, in part due to mild weather that reduces energy demand for heating and cooling. California leads the Nation in electricity generation from nonhydroelectric renewable energy sources, including geothermal power, wind power, fuel wood, landfill gas, and solar power. California is also a leading generator of hydroelectric power. California imports more electricity from other States than any other State. 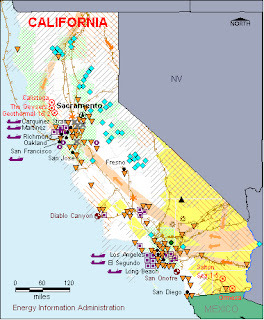 In 2000 and 2001, California suffered an energy crisis characterized by electricity price instability and four major blackouts affecting millions of customers. Two solar power plants are proposed for central California, covering 12.5 square miles and generating as much as 800 megawatts of power. North Dakota accounts for about 2 percent of total U.S. crude oil production. Due partly to high heating demand in winter, North Dakota’s per capita energy consumption is among the highest in the Nation. Nearly all of the electricity generated in North Dakota is produced by coal-fired power plants. North Dakota is one of the few States that allow the statewide use of conventional motor gasoline. North Dakota is a substantial producer of wind energy and leads the Nation in potential wind power capacity. 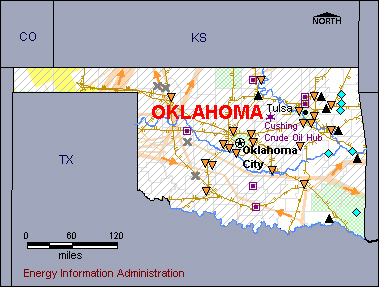 Oklahoma is one of the top natural gas-producing States in the Nation. More than a dozen of the 100 largest natural gas fields in the country are found in Oklahoma. Oklahoma has five petroleum refineries with a combined capacity of roughly 3 percent of the total U.S. distillation capacity. Cushing, Oklahoma, is the designated delivery point for NYMEX crude oil futures contracts. The Oklahoma State Legislature created the Commission on Marginally Producing Oil and Gas Wells in 1992 to keep State production decline to a minimum. Labels: Alaska, California, horizontal drilling, hydraulic fracturing, North Dakota, Oil pruduction, Oklahoma, Texas, U.S. Thanks -- very interesting and useful info.